Hello, dear readers! 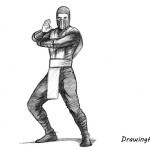 Today’s drawing lesson again is made at the request of our readers, and the main character of this lesson will be Smoke – the mysterious gray ninja, which later turned into a soulless cyborg killer. 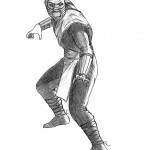 This is one of the characters of the legendary game Mortal Kombat, and in our previous lessons, we already drew other ninjas: Scorpion, Sub-Zero, and Reptile. 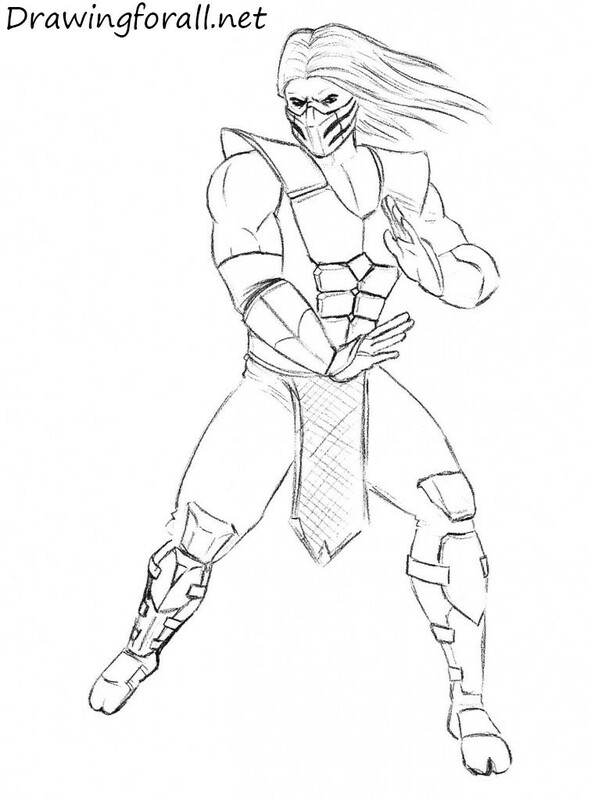 Well, today we will tell you how to draw Smoke from Mortal Kombat! The length of the legs is equal to the height of three or four heads (depends on human growth and physique.). First draw a head in the form of an oval. Do not forget in this step draw the vertical line of facial symmetry. Then, using the light and straight lines mark the line of the body. The human body – is very complex, perfect mechanism, but it can be schematically represented as a set of properly placed geometric shapes – cylinders, rectangles, triangles and balls. First draw the horizontal line of the eyes. Below the head sketch out the neck. 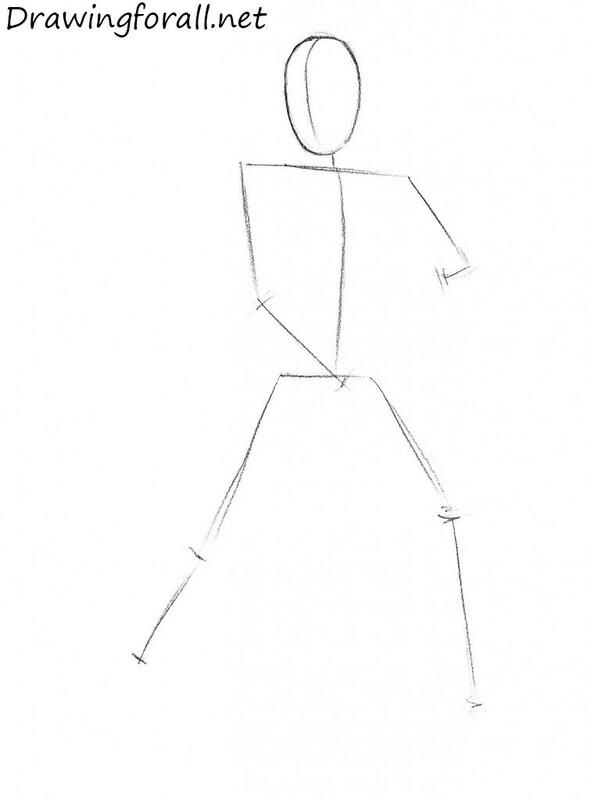 Draw the torso in the form of a tapering down rectangle. Then draw the balls for shoulders. Then, using cylinders mark the arms. Draw the pelvis, in the shape, similar to the triangle. 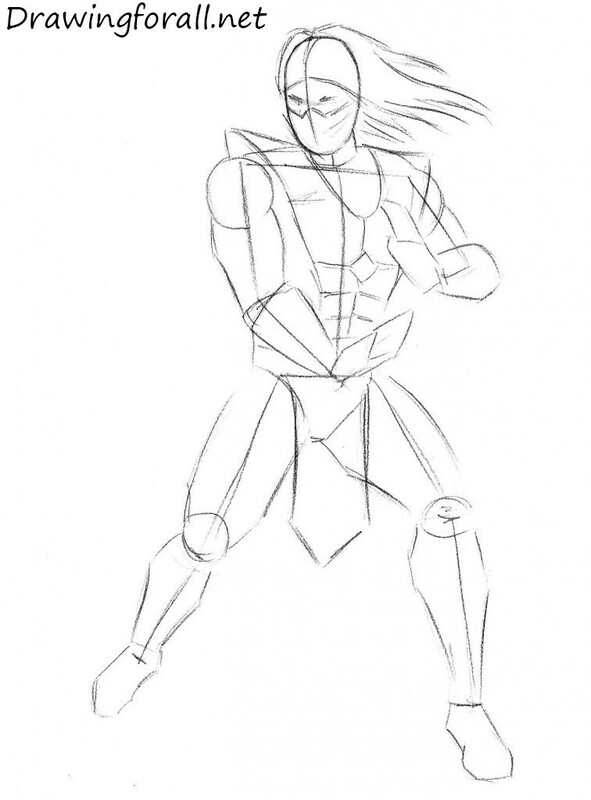 Then draw the legs, using big and modified cylinders. Legs of Smoke very powerful and muscular, so the cylinders, which we outline, must be sufficiently voluminous. Don’t forget to sketch out the hands and feet. Silhouette is ready, let’s begin to detail. We will add details from top to bottom. So, start with the head. Draw the outlines of the hair fluttering on wind, draw a frown and a contour of the mask, hiding the entire lower part of the face, including the nose. Then draw a samurai vest of our mysterious warrior. Please note that the lines of the vest is not parallel to the lines of the body, because it is quite voluminous. Draw the face of Smoke. As we have noted, the most of the face is hidden under the mask, so we have to pass tension of the face through his eyes. So, draw the eyes, using the horizontal line from the previous steps. Add some wrinkles around the eyes, that help us to convey the tensions of look. Using contours, drawn in the previous steps draw the mask, paying attention to the curves of the horizontal lines on the cheeks of Smoke. Erase extra guidelines from the torso of Smoke and circle all the plates of his vest. Pay attention to the anatomical shape of the garment – plates follow the contours of the pectoral muscles and the abdominal muscles, but, nevertheless, the vest should look free and spacious, the effect of a snug fit to the body should not be. Draw the right hand, focusing on guidelines from the previous steps. Draw large ball of deltoid and using a few smooth lines in the top of the arm draw the massive biceps. 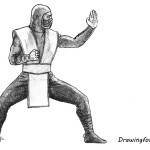 Draw the outlines of the gloves, which rise above the elbow, and draw patterns in the area of forearm and wrist. Draw the hand with straight fingers. 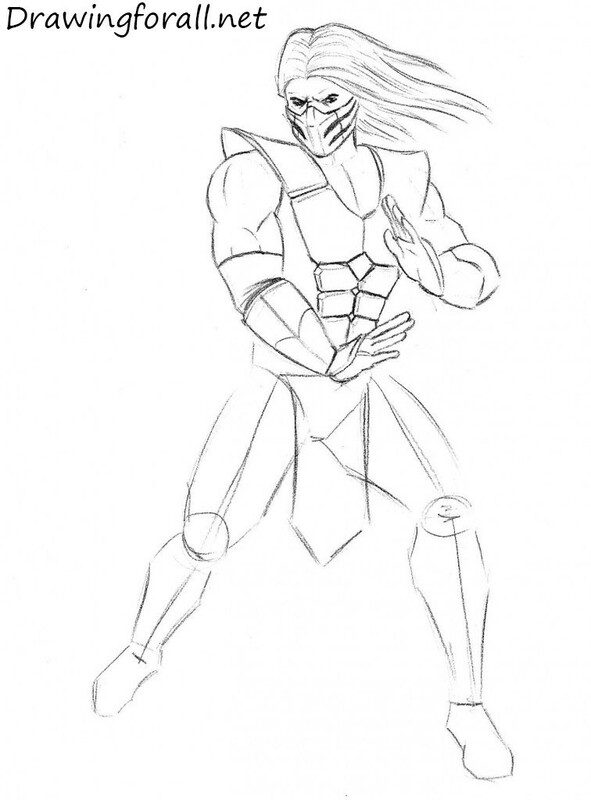 Continue the drawing lesson on how to draw Smoke from Mortal Kombat. In this step we draw the left hand of Smoke. As in the last step, draw a spherical deltoid muscle and contour of the arm. 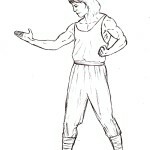 Then draw the forearm and hand, as in our example. Don’t forget to erase the guidelines. 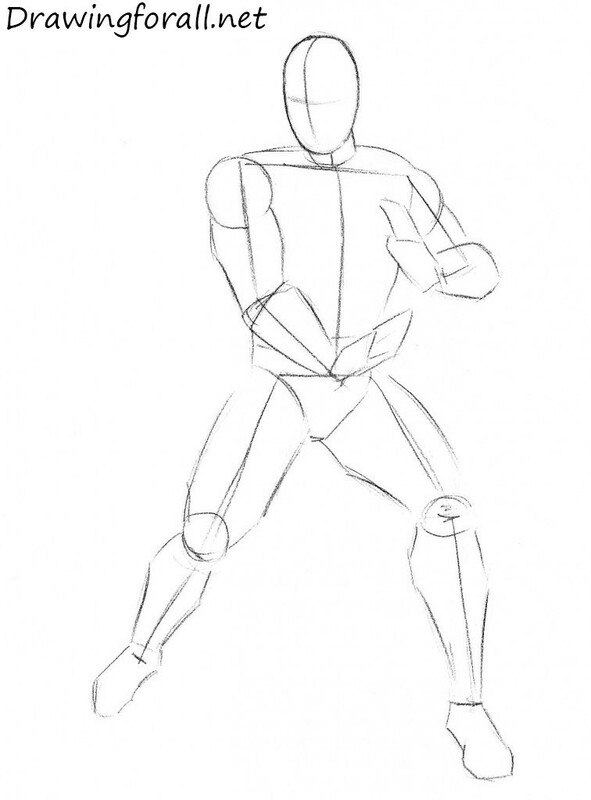 The penultimate step – draw the right leg and groin area. Erase extra guidelines, circle the silhouette of the hanging vest and outline a few wrinkles in the area of legs connected to the body. Next circle the leg and draw the armor, which is located on the lower part of the leg from the knee to the foot. 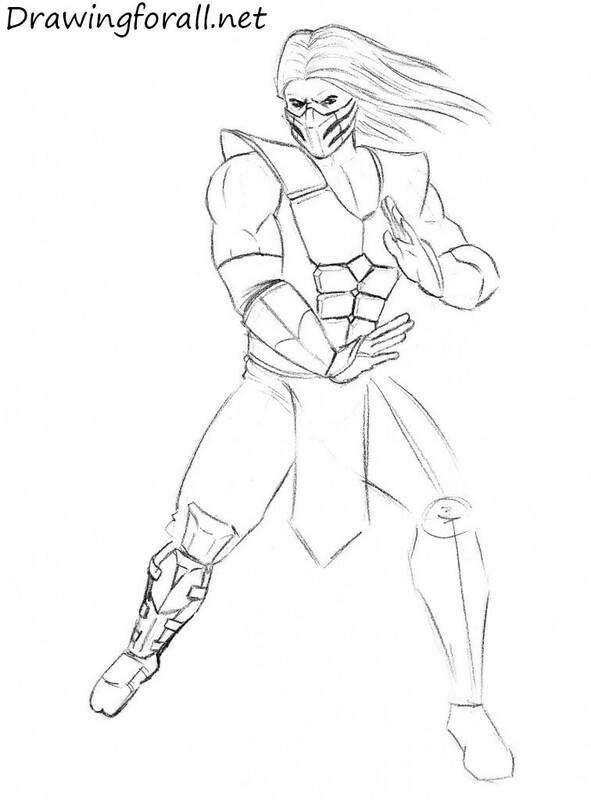 Now we do exactly the same action as in the previous step, but on the left leg – we draw the knee, greaves, fastened with straps and foot, visually separated by a special shoe in two parts (which makes the foot look like a foot of Ninja Turtles).